Rumors of the death of greentech investing would seem to be exaggerated. That brings Boston-Power's VC total to more than $300 million since it was founded in 2005. The round was led by GSR Ventures, a VC firm with operations in China and offices in Beijing and Silicon Valley. Existing investors Oak Investment Partners and Foundation Asset Management also invested in the round. The Chinese government is providing grants, loans and incentives. Venrock, an earlier investor and holder of a board seat, was not listed as an investor in this round. 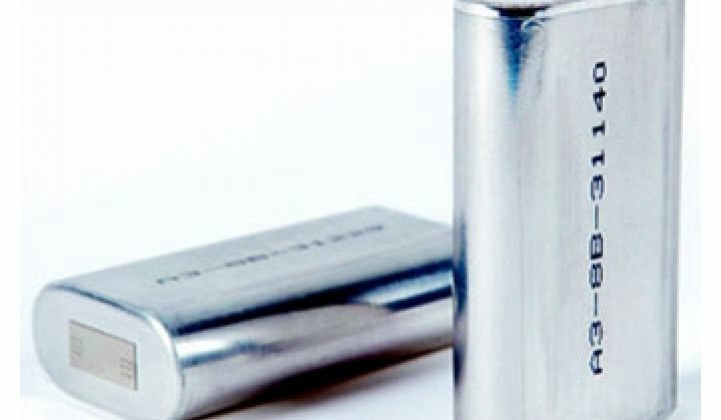 I spoke with the enthusiastic founder, Dr. Christina Lampe-Önnerud, and she repeated the normal messaging of Boston-Power -- that their lithium-ion battery has the highest energy density, and fastest charge, and is safe and green. She said that now that they have customer validation they will be "embarking on phenomenal growth." That entails building a factory in China capable of producing 400 megawatt-hours of batteries or 18 million units of the "matchbox-sized" prismatic lithium-ion cells. The funding will be used to build the factory along with a technical development center helped out in no small part by generous subsidies from China's government. Just as Tesla is using thousands of small batteries in their electric vehicle battery pack, Lampe-Önnerud agrees that smaller cells result in higher yield and safer products. The industry lore -- that small applications should have small cells while large applications should have large cells -- is just not true according to the company founder. Boston Power concentrates on familiar lithium cobalt chemistry, the same battery chemistry found in notebook cells. (The cobalt refers to materials in the battery's electrodes.) Boston-Power has refined the casing, anode, cathode and other battery internals for longer life and more cycles. Lampe-Önnerud said the biggest and "fastest growing market by far" is in electric vehicles and although they consider their product a platform capable of many applications, EVs are their current focus. The competition, however, is fierce. LG Chem produces batteries for the Chevy Volt and the Opel Ampera, the EU version of the Volt. A123 is an investor and battery supplier to Fisker Automotive (A123 lost the Volt contract to LG). Tesla's Model S uses batteries and battery packs from Panasonic. Earlier this year, Sony declared that it will produce lithium-ion batteries for electric vehicles and start selling them by the middle of the decade. Altair Nano is a small-cap public firm that builds advanced lithium-ion batteries but seems to be focusing on grid-scale storage at the moment. Saab has agreed to use Boston-Power's batteries in its electric car projects. A123 Systems (Nasdaq:A123), the lithium-ion battery firm, is the closet comparable to Boston Power. A123 went public in 2009, has a market capitalization of $612 million, and its stock trades at $4.50 down from its IPO price of $20 per share. It has yet to turn a profit. Boston-Power’s strategy is to focus on China, and to that end, the company is moving a number of positions and responsibilities from its Massachusetts offices to China. Lampe-Önnerud promises a big vehicle design-win to be announced in the next few weeks. The battery business, as mentioned, is fiercely competitive, with long-established and immense incumbents. Pricing and performance must be disruptive for a vehicle company to take a risk on a new player with no track record and no assurance of longevity. In an unusual move, the CEO and several other staff members parted the company last week.